This is definitely one we need in my house. My husband has diabetes, and we are always looking for more info and recipes for him. I have gotten several magazines from this company, and I've never paid a penny. 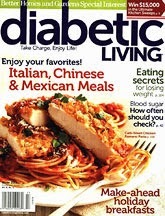 You can get a free subscription to Diabetic Living. This is from Free Biz Mag. It is completely free, and there are no automatic renewals.